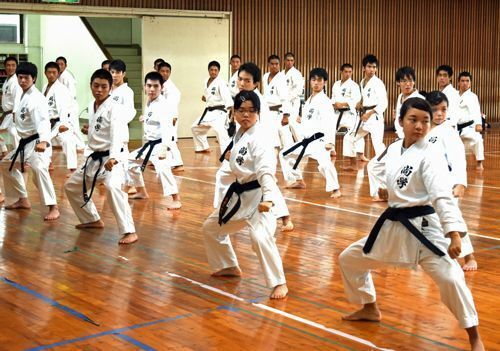 Okinawa Shogaku High School students look serious in an Okinawan karate class on October 5 at the school gym in Naha. The school and the federation signed the Agreement on Karate Training in August 2007. In class, students learn kata, or a routine comprised of various movements and techniques. In 8th grade, students choose a style of karate they wish to learn from the following four: Uechi-ryu, Goju-ryu, Shorin-ryu, and Matsubayashi-ryu. Those who start from high school primarily learn the Matsubayashi-ryu. There are also predetermined goals for each grade, such as 5-kyu for 7th grade, 3-kyu for 8th grade, and 2-kyu for 9th grade. Those who started in junior high school aim for a black belt, while those who started in high school aim for a brown belt by the time they graduate from high school. Twice a year, the federation holds grading tests. For 7th graders, it is only once a year. In 2015, more than 90 percent from each grade in junior high school achieved their goal, and in high school, it was 85 percent.